This is NextShift’s second patent, following their original patent US9694977B2, “Storage Material Handling System” that covers an advanced materials handling workflow in which autonomous mobile robots collaborate with warehouse workers but perform independently—i.e. without direct worker interaction—in order to enable a more efficient picking process involving fixed storage locations distributed in a storage space. After items have been placed into collection totes within the pick zones the mobile robots autonomously load, transport, and unload the totes at destinations around the facility. NextShift’s fundamentally different, robot-based supply chain workflow dramatically increases order handling velocity, efficiency and quality using a right-sized fleet of agile, intelligent robots to take over transporting inventory items from storage to the pick face and from picking zones to fulfillment stations. The uniquely collaborative approach frees workers from time-consuming trips back and forth through the warehouse and allows them to focus on higher-value job activities. 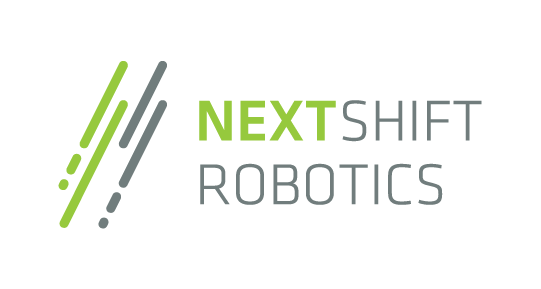 NextShift Robotics designs and manufactures collaborative, autonomous, mobile robotic systems that increase productivity in manufacturing and distribution centers. The company was founded to revolutionize material handling for e-retailers, 3PLs, OEMs, manufacturers, and brick and mortar businesses. Our uniquely dynamic robotic technology dramatically speeds up execution and increases existing warehouse capacity. Most importantly, by transforming the nature of work, NextShift raises employee productivity, job satisfaction and safety to new levels. Visit www.nextshiftrobotics.com.